With new blooms in season, changing flower fashions and a whole host of new botanical-inspired beauty products to try, there’s nothing not to love about the start of spring. 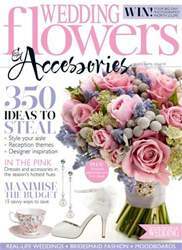 It’s the perfect time of year to get the lowdown on what’s set to trend in wedding flowers for the year ahead, and this issue is packed with ideas to get you feeling inspired. We’ve asked the experts to reveal just why fresh floral hair accessories are having a revival (page 12), and how to make the look work for you, as well as the best ways to decorate your aisle to ensure your ceremony really is one of a kind (page 14). April sees the start of peony season, and with more varieties available than ever before, it’s no wonder this beautiful bloom is still a hit with brides. Seek inspiration on how to incorporate them into your day from Rona Wheeldon’s A Bride’s Guide To Peonies on page 20, as well as in our Truly Scrumptious receptions shoot on page 18 and Moodboards starting on page 27. As ever, Flower Notebook is packed with bouquet and tablecentre ideas – which colour scheme will you choose? I’ve fallen in love with our collection of statement pinks and purples which can work perfectly for any time of year, just speak to your florist about which varieties will be in season when you’re getting married. Until next time!